My mom took me to see Dr. Hoch when I started running track in school and my hip and bunions started hurting. Dr. Hoch treated me with regular weekly adjustments for my hip and lower back and scoliosis (which one doctor told me I had after having several school physicals throughout the years). She also suggested orthotics for my shoes to correct my foot balance, poor posture and reduce the bunion pain. She told me the bone callus (bunions) may reduce in size in time, but may never go away completely. I got my orthotics and wore them immediately with new tennis shoes. Within a couple of weeks of wearing them, along with getting my feet adjusted and my spine adjusted my bunions stopped hurting, my back and hip stopped hurting as well, and after 6 months, the x-rays showed improvement in my scoliosis. I now am involved in several sports and enjoying them without pain. 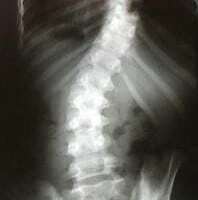 I have a disorder known as scoliosis and was having numbness in my fingers and stiffness in my back. I had not been to a chiropractor before, but I was willing to try. The first few times the adjustments hurt, but after doing the recommended exercises, stretching and watching my posture, I have no numbness and no stiffness. My sister also sees Dr. Hoch. I am very confident in chiropractic and recommend it to others.